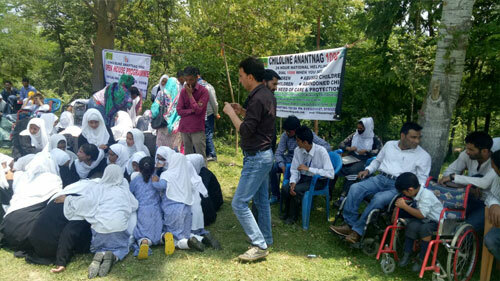 An inclusive open house program was organized by Childline Anantnag in collaboration with Zaiba Aapa Institute of Inclusive Education and Humanity Welfare Organization Helpline Bijbehara. In this program around 70 students of Govt. High School and 20 students of Zaiba Aapa Institute of inclusive Education participated. To aware studentsand teachers of the school about childline, child rights, child protection and child sexual abuse. 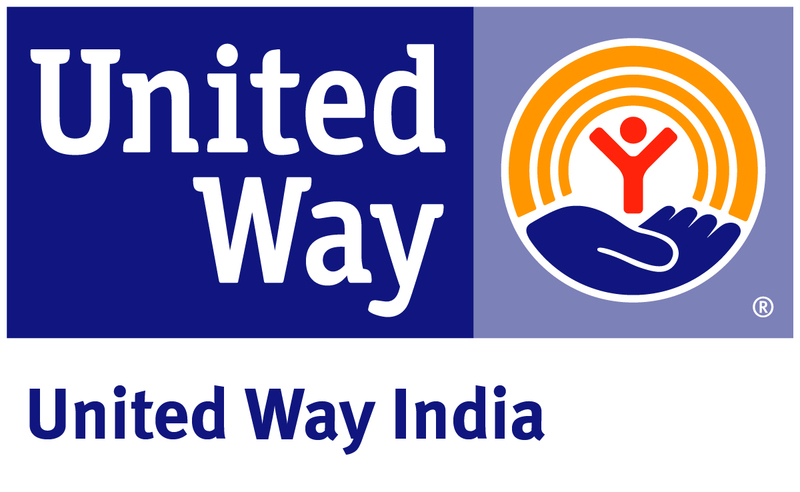 To create awareness among students and teachers of the school about various types of disabilities. To aware students and teachers of the school about various hidden talents of disable children. To have an interaction session between able and disable children, so that they can know abilities of each other. Session 1: Greetings and introduction of participants with each other. Session 2: Introduction about Childline. Session3: Awareness about child rights, child protection and child abuse. Session4: Information and achievements of Zaiba Aapa Institute of Inclusive Education. Session5: Awareness about various types of disabilities. Session6: Information and awareness about sign language and Braille education. Session7: Session by teachers of the school. Session8: Vote of thanks and brief awareness about roles and responsibilities of students and teachers. The program started at around 10AM with the greetings and introduction of participants with each other. After that 2 able students and 2 disable students recited few verses from quran and after that they recited naat. This session ended at around 10:30AM. This session started at around 10:30 AM. Team member Imtiyaz Ahmad awared students and teachers about 24 hour toll free no. 1098 and services provided by Childline. He also gave them awareness regarding how and when any concerned adult or children can dial this toll free no. 1098. This session ended around 10:45AM. This session started at around 10:45AM. Coordinator Childline Anantnag Ayash Ali Masoodi gave detailed information to all participants about UNCRC and child rights. He awared children about their 4 basic rights, i.e. Rights to Survival, Right to Participation, Right to Development and Right to Protection. He also awared all the participants about Child abuse and its various categories, i.e. physical abuse, emotional abuse, neglect and sexual abuse. Children were given detailed information about child sexual abuse and what they cando in case they will feel unsafe with someone or at some place or if someone will try to exploit them. An activity namely making of safe circles was also done with children. The teachers were then given awareness about their roles and responsibilities in making sure all children are safe and were also awared about various symptoms of abused children and what they can do in case they find any abused children. The session ended at around 11:10AM. This session started at around 11:30AM. In this session the participants were given awareness about various types of disabilities by MR. Javed Ahmad Tak. He gave detailed information about various types of disabilities. He also informed participants how we can get involved and how we can help children with various disabilities. He told participants about role of special schools and special educators in educating the children with various disabilities. He also told participants how we can transform the lives of children with disabilities by giving them proper care and sending them to special schools where they can avail all facilities which are required in getting hassle free education. He gave participants examples of various disable persons who are living a successful life and told them that disable persons are no more dependent on others and can compete with others if they will be provided right environment. This session ended at around 12:00 Noon. This session started at around 12:00 Noon and in this session awareness was given to participants about Braille education and sign language. First of all participants were informed about Braille and how we can educate blind children through Braille. In order to make this session interactive few blind students were called on stage and they practically showed participants how they read and write through Braille education. One blind student was told to write a sentence through Braille and another blind student was then asked to read it. With this all participants came to know how blind students read and write. After that few deaf and dumb students were called on stage and they were told through sign language to write some essays and also gave their introduction on white board. All participants became emotional after seeing how talented these disable children are and if right environment is provided to them then how far they can go in making a successful career. After that the participants were deliberated how children with intellectual disabilities are given basic education through ipads and how much enthusiastic and comfortable they are while reading through Ipads and how easily they solve various puzzles on ipads. Later in this session one blind boy namely Yasir Ahmad, who recently passed 10th class examination through CBSE with 68% marks interacted with participants and shared his experience and told participants about the hardships which he faced throughout his whole journey and role which ZAIIE played in transforming his career post his blindness in 2014. This session ended at around 1:00PM. This session started at around 1:15PM. In this session the teachers of Govt. High School Wobzan gave their feedbacks about this program and also gave vent to their emotions regarding the work which is needed to be done in disability sector. They appreciated and thanked Childline Anantnag team and ZAIIE team for organizing this program and for doing such a wonderful work for children especially for disable children. They hoped ZAIIE will continue their good work and hoped that in future as well they will continue to educate these disable children. They also hoped that more and more disable children will excel in various fields and will become role model for others. They also donated some money on the occasion for education of disable children to ZAIIE. They also filled bank forms and became monthly donors of ZAIIE and hoped that their donations will help in educating more and more disable children. 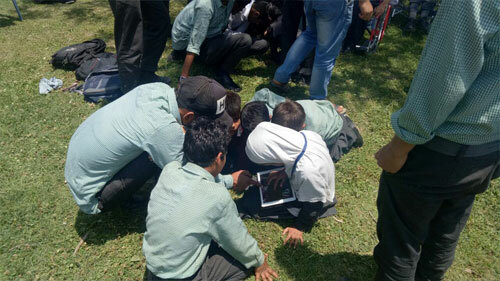 They on the occasion showed their helplessness towards lack of proper infrastructure and resources in various schools in J&K and hoped that in future Govt. will take steps and will make each and every school disable friendly school. This session ended at around 1:45PM. This session started at around 1:45. 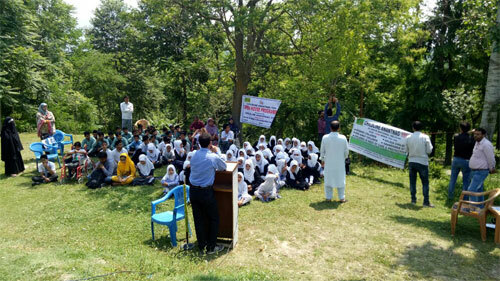 In this session the honorary Chairman HWOHL and Director Childline Anantnag Mr. Javed Ahmad Tak gave his vote of thanks to all students and teachers of the school and thanked all the teachers for allowing Childline Anantnag and ZAIIE Team to organize this program in the school premises. He also gave briefinformation about roles and responsibilities of students and teachers in transforming the society and in eroding the evils which are currently prevailing in our society. He also informed them about the importance of co curricular activities. While describing the teachers of the said school as cream of Bijbehara, he appreciated the teachers for their role in educating the students. He hoped that all other teachers will learn from them and will treat every student as their own children as teachers of the said school have done. He also thanked them for donating towards this noble cause and hoped more and more people will join this noble cause in future as well. It was also decided that in future the students of the school will visit the ZAIIE and will interact with disable students of the school. This session ended at around 2:00PM. This session started at around 2:00AM. 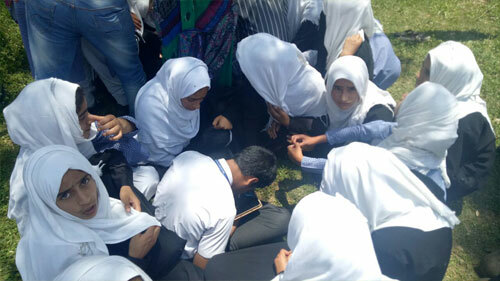 In this session an inclusive games competition was organized in which both able and disable students played various games like chess, volleyball, cricket, carom etc together. All students enjoyed a lot and hoped these types of programs will take place in future as well. With the end of this session the program ended at around 3:30Pm with appreciation from one and all.